Reactive oxygen species (ROS) are central to plant stress response, signalling, development and a multitude of other processes. 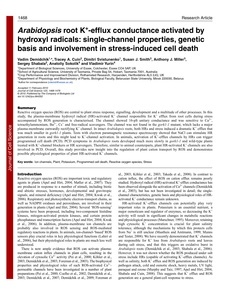 In this study, the plasma-membrane hydroxyl radical (HR)-activated K+ channel responsible for K+ efflux from root cells during stress accompanied by ROS generation is characterised. The channel showed 16-pS unitary conductance and was sensitive to Ca2+, tetraethylammonium, Ba2+, Cs+ and free-radical scavengers. The channel was not found in the gork1-1 mutant, which lacks a major plasma-membrane outwardly rectifying K+ channel. In intact Arabidopsis roots, both HRs and stress induced a dramatic K+ efflux that was much smaller in gork1-1 plants. Tests with electron paramagnetic resonance spectroscopy showed that NaCl can stimulate HR generation in roots and this might lead to K+-channel activation. In animals, activation of K+-efflux channels by HRs can trigger programmed cell death (PCD). PCD symptoms in Arabidopsis roots developed much more slowly in gork1-1 and wild-type plants treated with K+-channel blockers or HR scavengers. Therefore, similar to animal counterparts, plant HR-activated K+ channels are also involved in PCD. Overall, this study provides new insight into the regulation of plant cation transport by ROS and demonstrates possible physiological properties of plant HR-activated K+ channels.